I love Paris! I like it in the spring, the summer and even in the fall. I am also one of the lucky girls who gets to go there often. In Paris I stay with my very Parisian friend who opens his doors to me, which leads to great things when I am in the city of lights. My home away from home is a flat in the 13th arrondissement and as I use this as my home base while there, most recently at the end of March and the first week of April. This time I had the chance to see Paris turn from a wet March to a lovely April spring. So now it is your time to visit. And for those visitors who want a real local experience here is what tops my list of five “must dos” in order to get the Paris vibe. First of all, before we get started, let me point out I absolutely hate lugging my bags every time my friend and I are heading to the airport for a weekend trip or to the train station. You still must do it. Get to know and take the Metro in Paris – you will thank me. You have to do it, otherwise, you aren’t getting the real deal. Like I said, I stay in the in 13th arrondissement when I am in Paris so let’s start with that area. Number one on my list of five reasons to visit Paris is because of an area in the 13th that most tourists don’t know about. It is called the Butte aux Cailles (it means quail hill) district and it is reminiscent of a village even if it is in the heart of this Parisian district. There are many unusual restaurants and bars all lining the narrow cobblestone streets with an art deco architectural heritage – think Paris 80 years ago. Butte aux Cailles is a hangout for artists and affluent hipsters, but expect some hills in this charming little area because you will have to make a climb. 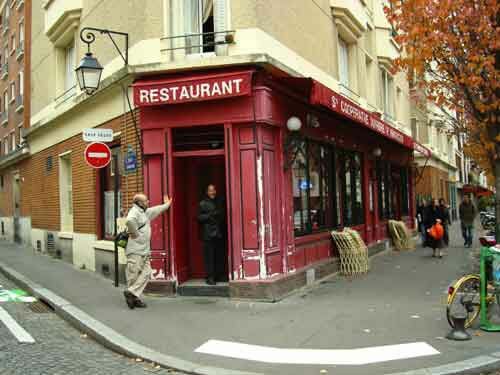 Butte aux Cailles is sandwiched in between the city’s Chinatown district at Metro Tolbiac, Corvisart and the Place d’Italie and it is the perfect way to get to know Paris from a local perspective. Next stop, well, you need a place to lay your head for a night or two or hopefully you give yourself a good week in Paris. My number one recommendation is the Shangri-La in the 16th arrondissement. The Shangri-La is also an easy walk to the Champs de Elysées and a variety of museums. Keep in mind in Paris, the Michelin starred restaurants rule so there is no need to doubt that the Shangri-La isn’t dressed to impress with two Michelin restaurants on the premises. My last trip in March was my second time to not only stay in the Shangri-La palace, but also to have dinner at L’Abeille, roughly translated meaning “The Bee, which was Napoleon’s favorite emblem. The palace has ties to Napoleon’s family, but more on that in a minute. L’Abeille is two Michelin-starred and is under the guidance of the Executive Chef Christophe Moret. Located in an enchanting atmosphere next to the garden, the restaurant promises delightful flavors, pairings and ambience. Moret was previously at the Saint Jean-de-Luz Grand Hotel and then at Château Eza before teaming up with Chef Jacques Maximin at the Nice Théâtre in 1989. Starting in 1990, he worked alongside the renowned Chef Alain Ducasse at the three-star restaurant, Louis XV in Monaco. Continuing to move he then was at Royal Monceau and 59 Poincaré as a sous chef and became the head chef at Spoon, Food & Wine in Paris and then in 2003 he became head chef at the three-star restaurant Alain Ducasse au Plaza Athénée. From there he was at Lasserre, another Michelin-two-starred restaurant, finally making the Shangri-La Hotel his next turn at culinary creativity. Shang Palace, the second starred restaurant at Shangri-La is a Canton and Huaiyang regional themed menu helmed by Chef Samuel Lee Sum and worthy of a meal as well. As for the palace part of the story, the Shangri-La, Paris was the home of Napoleon Bonaparte’s grandnephew, Prince Roland Bonaparte in 1896. No. 10 avenue d’Iéna was at that time a meeting place of aristocracy and bourgeoisie. Now 115 years later it has been restored by architect Richard Martinet and offers a bright welcome that begins with the open lobby and the impressive grand staircase. In the rooms the views of the Eiffel Tower and the River Seine are some of the best hotel views in Paris complete with old-world charm. The Shangri-La recently launched a useful guidebook for guests; “10 Parisian Walks.” There is even a “10 Parisian Walks” package that includes a night at the hotel, a breakfast, champagne and a guided tour of the fascinating history of the palace. The themed walks highlight Parisian life including gourmet rendezvous, secret addresses and the backstreets waiting to be discovered. Also, in the 16th arrondisement and near the Shangri-La is a remarkable fashion museum called the Palais Galliera at 10 avenue Pierre 1er de Serbie. I had the pleasure of learning about the fashion of de la Comtesse Greffulhe when I was there. On May 14 a new exhibit will be showing until October asking the question who wears what? This is the question put to the visitor by the Palais Galliera’s Anatomy of a Collection exhibition. Ranging from court wear to work overalls and from celebrities to unknowns, the exhibition draws on the Galliera collection looking at 100 garments and accessories illustrating fashion from the 18th century to the present day. From Napoleon’s waistcoat to Empress Josephine’s dress to Gala Dali’s shoe-hat or a dress worn by the Duchess of Windsor, this collection reflects the essence of the outfit and how it has become a part of history over the years. The Palais Galliera is also a perfect look into the 19th-century architectural tradition in Paris and the construction was by the company belonging to Gustave Eiffel. The Duchesse de Galliera was considered a generous woman even though in the end her roots were in Italy. She did leave this building and palace for the city of Paris and the fashion museum is a secret discovery in the 16th district. Heading over to the 8th arrondisement you will also find another of my “under the radar” recommendations. The Musée Nissim de Camondo is a peek into the 18th and 19th century in what is called a “hôtel particulier.” The owners were a banking family and the museum is located in the northwestern part of the 8th near Parc Monceau. This museum is part of a larger group of museums featuring décor, textiles and fashion. It is also a good excuse to visit the Park Monceau while in the area. The Park Monceau is a 17th century garden in Paris and notably one of the most elegant with a number of statues and a stunning Renaissance archway. After a day of seeing the sights à la Parisienne, a dinner is certainly in order and the restaurant at Le Royal Monceau – Raffles Paris called Il Cappacio, a one Michelin star experience, is the perfect end to a lovely day. An Italian restaurant in the heart of Paris, Il Carpacciohas been opened for the past 30 years with Executive Chef Roberto Rispoli creating a personal interpretation of his recipes from Italy and its many regions. Rispoli is from the Naples area and he has revived Il Carpaccio with chef Laurent André at the helm. It is an intimate dining room with a Sicilian baroque design, a glass conservatory that looks outside and a bit of contemporary art in the décor perfectly working with the Italian theme. Other than the menu, which will need no introduction, the wine selection by the Sommelier is worthy of the trip alone. Taste the delightfully sinful olive oil since it is Chef Rispoli’s own extra virgin and is created in Sicily. Expect flavors that add to the already unparalleled combination of Italian delicacy at this brilliant Italian masterpiece of flavors. Have you enjoyed Paris? Looking behind the scenes and getting to know the city with the feeling of a Parisian and you have discovered the staple of the Parisienne mindset. Indeed, you now know why Paris has a personality that is incomparable around the world. Next articleUS Virgin Islands: Isn’t It Time You Visited?